The 4-H GIS Software Grant Program has helped more than 725 4-H clubs begin GIS programs. 4-H youth are learning about community, technology, and careers as a result of their GIS service projects. 4-H after-school curriculum can include technical programs that support the US government's science, technology, engineering, and mathematics (STEM) program. 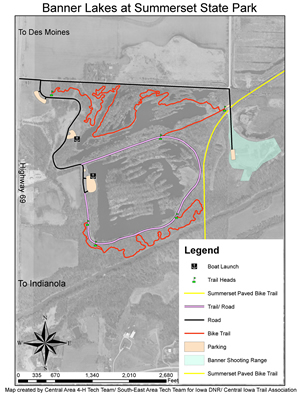 A joint project between two 4-H Club Tech Teams in Iowa to map the trails and facilities available in local recreational areas. Across the United States, 4-H clubs have implemented GIS programs—supported by grants from Esri—that have enhanced members' understanding of science and technology and enriched their communities. Jim Kahler, 4-H program specialist, United States Department of Agriculture (USDA), comments, "GIS technology contributes to the 4-H science program goals because it teaches youth about a technology that most have never used. They also learn more about the subject that they are mapping—plants and animals, wildlife, natural resources, or historic places. GIS is also a good tool to integrate with other 4-H content areas, such as nutrition and health, citizenship, and communications." A. B. Graham, a school principal in Springfield, Ohio, is credited with starting what was to become the 4-H Club. In 1902, motivated by the large numbers of young people who were leaving their farms for work in the city, Graham began promoting after-school programs to educate youth in the practical arts of scientific agriculture to improve crop harvests and safely preserve food. The national 4-H organization was officially formed in 1914 when the United States Congress created the Cooperative Extension Service within USDA, consolidating various boys' and girls' clubs that were involved with agriculture, home economics, and related subjects. Later, the 4-H after-school curriculum was expanded to include technical programs, such as the 4-H Science Initiative, which supports the STEM program implemented by the US government to improve the science and technical skills of elementary and secondary school students. The goals of the 4-H Science Initiative and STEM program are being promoted through projects such as the USDA's Economic Research Services Food Environment Atlas. For this project, 4-H clubs have collected data regarding the availability of wholesome food within their communities. 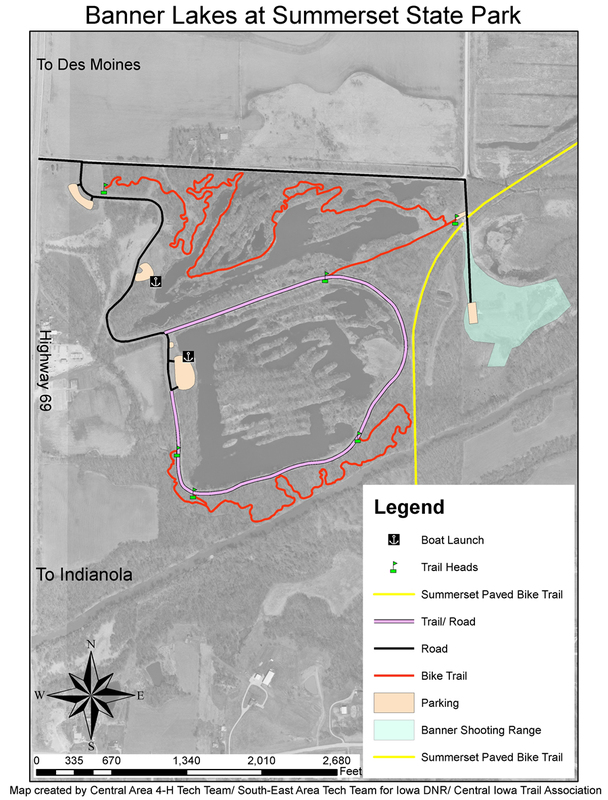 Other projects have included work with local US Fish and Wildlife professionals, mapping wildlife refuges and identifying areas of concern for future monitoring. Clubs have also mapped invasive weed infestations and assisted with local disaster preparedness plans. These projects allow club members to not only improve their STEM skills but also meet 4-H requirements for community service projects. Since its inception in 2004, the 4-H GIS Software Grant Program, sponsored by Esri, has helped more than 725 4-H clubs begin and sustain GIS programs for their members with grants of ArcGIS software and Virtual Campus training. 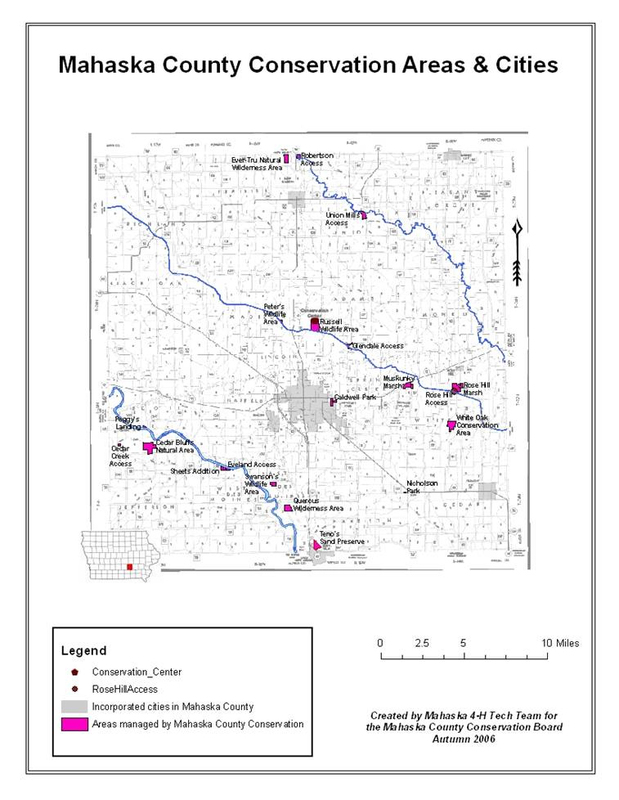 A map depicting all the conservation areas and cities in Mahaska County, Iowa. It was the first map created by the 4-H Southeast Area Tech Team. Esther Worker, informal education manager at Esri, says, "The GIS software grants have empowered 4-H youth to take an active role in researching and investigating their communities. 4-H youth are learning about community, technology, and careers as a result of their GIS service projects. "Another benefit derived from the relationship between Esri and 4-H is the opportunity for the 4-H national GIS/GPS leadership team to send delegates to Esri's annual Education User Conference [EdUC]. The team comprises selected 4-H youth and their adult mentors from across the United States. At the EdUC, they participate in local mapping projects, attend sessions and workshops, and present projects they have been working on during the preceding year." Debbie Stevens, adjunct professor at William Penn University, has been a volunteer with her local 4-H Club in Oskaloosa, Iowa, for more than six years. The area has a long history with 4-H, and many current members have great-grandparents who were once in the same local club. Because 4-H is a traditional part of community life, Stevens has been successful in raising money from local businesses for funding special projects, such as buying the equipment needed for their mobile tech lab. "Our community leaders didn't know much about GIS at the time," says Stevens, "but because we were focusing on the benefits to youth and using emerging technology, prominent businessmen supported the project and had faith that our 4-H youth would benefit, as would our community. We were able to purchase 10 laptops, a wireless printer, digital camera, GPS kit (with 10 Garmin eTrex units and 10 compasses), and 2 Recons." Since her involvement with the club, the local 4-H Southeast Area Tech Team has completed a number of GIS-based community projects that include plotting the location of available industrial properties for economic redevelopment; creating trail and facility maps in local recreational areas; and mapping cultural, retail, and commercial downtown districts for the Oskaloosa Chamber of Commerce. 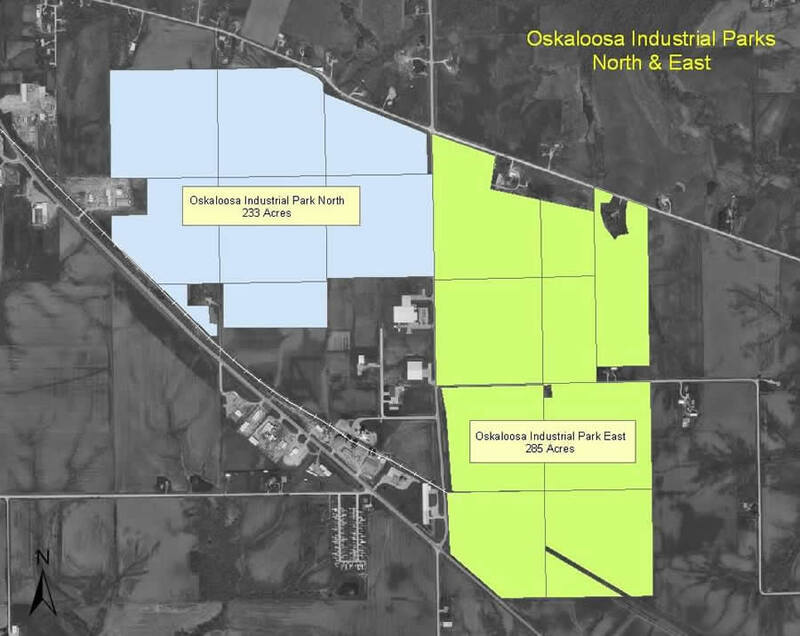 A map of available industrial properties in Oskaloosa, Iowa, created for the local economic development group for strategic planning purposes. The group is currently preparing a major project with officials in Oskaloosa that involves a citywide inventory of all ash trees. The data collected will be used to institute an abatement program in the event of an emerald ash borer infestation. This highly destructive insect was first detected in the United States about 10 years ago and has spread rapidly since that time. The data collected by the 4-H group will also be made available to the USDA Animal and Plant Health Inspection Service, which is coordinating a national effort to minimize the ecological impact of this invasive insect. 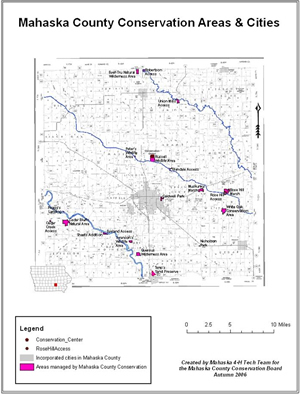 The club also maps the locations of local hog confinements, referred to as confined animal feeding operations. Mapping these sites provides critical health and planning information for the community, as hogs living in confined areas produce excessive amounts of excrement that decomposes into a variety of particulate matter and toxic gases, including ammonia and hydrogen sulfide. When these gases are released into the atmosphere, they can be detrimental to the health of those in the area. Stevens concludes, "This is the information age, and it is critically important for youth to learn IT skills. I can think of no better information management system than GIS—all pertinent information is stored in tables directly related to locations on a map. The map is used to paint a picture with that data. Whether it is about climate or transportation, a map is much easier to read and understand than analyzing the related spreadsheet. "So when you can connect young people to an activity that is relevant in nearly any career path—transportation, government, business, science, conservation, environment, education, agriculture, emergency planning, forestry, fire fighting, community planning, health care—and the application is fun, you can't lose!" For more information, contact Debbie Stevens, career services coordinator, William Penn University (e-mail: stevensde@wmpenn.edu), or David Runneals, Central Area 4-H Technology Team (e-mail: runneals@extension.org).